Bills head coach Doug Marrone said WR Stevie Johnson is not expected to be available for Sunday’s game. Johnson is currently tending to his family in his native California after the unexpected passing of his mother. Marrone said that their support of Johnson and his family far outweighs his availability for Sunday’s game. After losing his mother, who passed unexpectedly over the weekend, Stevie Johnson’s availability for Sunday’s game against the Dolphins is undetermined. Head coach Doug Marrone may shed some light on the receiver’s situation in his Wednesday press conference this afternoon, but Bills President and CEO Russ Brandon did confirm one thing concerning Johnson. In his weekly radio appearance on WGR Sportsradio 550, Brandon said that the team will provide Johnson with any means of support that he or his family might need this week. Stevie Johnson will no doubt be spending time with his family this week to mourn the loss of his mother after she passed unexpectedly at the age of 48 last weekend. How long he’ll be back in his native California is unclear at this time and head coach Doug Marrone did not feel it necessary to share any details at this time. Bills WR Stevie Johnson made the decision Sunday to play against Jacksonville, despite getting the news of his mother’s unexpected passing the day before. Keeping that news to himself until after the game has earned him added respect in Buffalo’s locker room from teammates that are ready to prop him up at this difficult time. Team captain Fred Jackson, in his weekly appearance on Bills flagship station WGR Sportsradio 550 said they’re ready to help Johnson through this difficult time in any way that they can. “I know I just speak for all my teammates when I say we really appreciate him for doing what he did (Sunday),” said Jackson. “That’s got to be one of the hardest things in the world to do trying to move past the death of your mother. We really do appreciate him for coming out and sticking with us. All we can do is ask him what he needs from us. Jackson heard about the time coach Marrone spent with Johnson on Saturday after getting the terrible news and said he would not have expected anything less from their head coach. “With coach Marrone he’s a guy who has been where we are. He knows the grind that we go through. He knows what we put ourselves through week in and week out. He’s more of a personable coach,” Jackson said. “He’s a coach you can approach and talk to about anything and that’s just an example of it. Prayers are with @steviejohnson13 & his family. Prayers go out to my boy @StevieJohnson13 and his family. Everyone cherish your time with you family this holiday season. The backlash Stevie Johnson experienced in the wake of his late game fumble might discourage a player of lesser stature, but that’s not the case with Buffalo’s top wideout. If anything the criticism has been used as fuel. Johnson said he didn’t need a wakeup call, but is ready to rebound from it. After Sunday’s game Johnson said he got himself straightened out and is focused on improving his play moving forward. He was again getting extra pass game work in with EJ Manuel after practice Wednesday. Johnson met with head coach Doug Marrone this week, who wanted to check in on him to make sure he had moved past his late game miscue. Leodis McKelvin is all too aware of the public backlash directed at Stevie Johnson after his fumble late in regulation that cost Buffalo one of their two chances to win the game. But as McKelvin sees it the game wouldn’t have been tied at 31 without Stevie Johnson either. McKelvin believes the way to get on the right side of these close games more often is to come out on top on more of the smaller battles within the game. “You’ve got to win more of your individual battles. That’s it, point blank period. You’ve got to win individual battles. Stevie Johnson was naturally ticked off about his fumble late in the game. He knew the significance of it right away. But the way the game unraveled for them at the end preventing them from winning the back and forth contest was the real issue for him. Johnson and Chandler both had good technique in tucking the ball away on their fumble plays. Falcons defenders just made better ones as they see it. The Bills had a chance to win their back and forth game with the Falcons Sunday at the Rogers Centre late in the fourth quarter and in overtime. But fumbles on back to back possessions ultimately led to a game-winning field goal for Atlanta. For Stevie Johnson and Scott Chandler the circumstances were tough to bear. “It hurts,” said Chandler. “You hate to let the fans down and you really hate to let your teammates down. But that’s part of the game. You want to make all the plays and you want to finish all the plays the right way. I just didn’t do it that time. Stevie Johnson, whose fumble came late in regulation with the team within yards of a game-winning field goal attempt, took his miscue especially hard. Bills WR Stevie Johnson and DT Marcell Dareus will be making an appearance north of the border Friday where they’ll be available for autographs. 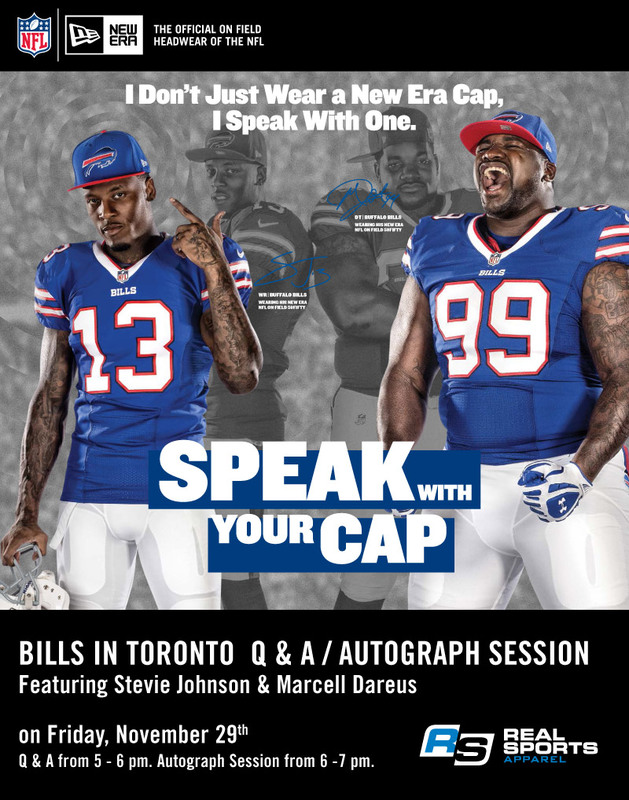 Johnson and Dareus will participate in a Q&A session hosted by Sportsnet’s Ken Reid for 45 minutes. Then the players will sign autographs for fans for one hour. They’ll be at the Real Sports apparel store at 15 York Street in Maple Leaf Square at the corner of Bremner Blvd. and York between 5 and 7 pm. Stevie Johnson is a receiver who wears his emotions on his sleeve, especially during games. So when things have not gone as planned some Sundays it has led to palpable frustration for the Bills top wideout. Head coach Doug Marrone revealed that he had a long sit down with Johnson to feel his receiver out a bit and understand what was bugging him. “I had a long talk with Stevie about the challenges coming in, with a young quarterback and then the injuries and the different quarterbacks,” said Marrone. “When EJ was healthy, Stevie wasn’t. When Stevie was healthy, EJ wasn’t. You play with different quarterbacks and it’s very difficult. I told Stevie, I said people are going to look at the end of the day and say this is down, this is down, this is down, and they’re really not going to look at the whole situation. Johnson sounded satisfied with the talk he had with his head coach and made sure to point out that his frustration lies with the overall lack of success of the team in win-loss column, not his personal stats. He says he’s optimistic about returning to the lineup for the Bills next game. Tonight, Stevie Johnson will talk about his status when he appears on The John Murphy Show. Johnson missed last Sunday’s win over the Jets with a groin injury suffered the prior week against Pittsburgh. It was the second game Johnson missed this season after he went three consecutive years without missing a game. Stevie told reporters this week his groin is getting better and the bye week comes at the right time for him. Bills head coach Doug Marrone indicated on Monday that he felt Stevie Johnson would be ready to return to the lineup in Week 13 against Atlanta after missing last Sunday’s game with a groin injury. Johnson confirmed that assessment Tuesday. Johnson will be staying in town through the bye week to continue his rehabilitation work to get his body in top form for the stretch run of the season. Stevie Johnson and Robert Woods were both unable to play in Sunday’s win over the Jets. With the benefit of the bye week this week however, head coach Doug Marrone is fully expecting to have both receivers back in the lineup in Week 13. When asked if Johnson and Woods would be good to go coming off the bye, Marrone gave a terse response. “I do, yes I do,” he said. Johnson is recovering from a groin injury suffered at Pittsburgh in Week 10, while Woods has missed the last two games with a high ankle sprain suffered in Week 9 against the Chiefs. Wide receiver Stevie Johnson has been declared out for Sunday’s game By head coach Doug Marrone. More details to follow it Buffalobills.com. With Robert Woods already declared out and Stevie Johnson pretty iffy going into Sunday’s game with a groin injury, Bills head coach Doug Marrone is going to be a bit shorthanded at receiver against the Jets this weekend. When asked if he intends to elevate a receiver from the practice squad, Marrone indicated that would not a consideration this week. Buffalo’s offense began to incorporate rookie TE Chris Gragg in the passing game and may give some time to recently signed H-back Evan Rodriguez. Another option could be C.J. Spiller, who has been used at receiver in the past when injury has struck the position. Bills head coach Doug Marrone provided an update on Stevie Johnson’s availability for Sunday now that he’s missed two straight days of practice. “Obviously Stevie has missed two days and I don’t feel good about him being able to play, but I can’t officially rule him out yet,” said Marrone. Johnson is dealing with a groin injury suffered last week. How can the offense rediscover its rhythm? The Bills offense has some stuff on its to-do list after last Sunday’s game. Finding its rhythm will require some positive plays. Realizing that stringing together eight to 10-play scoring drives all game is a bit unrealistic for where the Buffalo offense is at right now in terms of development, Stevie Johnson believes just a persistent, gutty performance could be enough to get them over the hump this Sunday. The Bills didn’t run the ball well against the Dolphins back in Week 7, but made just enough third down conversions, got a couple of key takeaways including one for a score and it was enough for their first and only division win so far this season.